5. 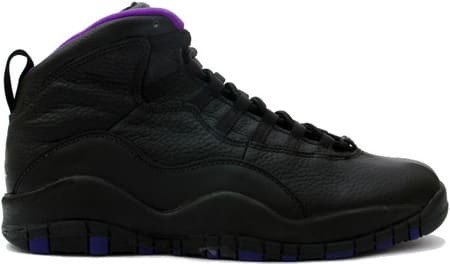 Air Jordan X "Sacramento"
The Air Jordan X didn't get a legit all-black release until they got retroed — but for a lucky few in 1995, there were the Sacramentos. Jordan Brand laced perennial All-Star Mitch Richmond with one of the City Series joints to immortalize his Kings in Jordan history. It has been a minute since the Sacremento has been kings of the left coast — probably going to be a minute before these release again too. Which is too bad, because the black and purple was real mean.